Fair, sand, fair, sand, fair, sand. That was pretty much my mantra over the past few days, and I'm pretty happy it's almost over. 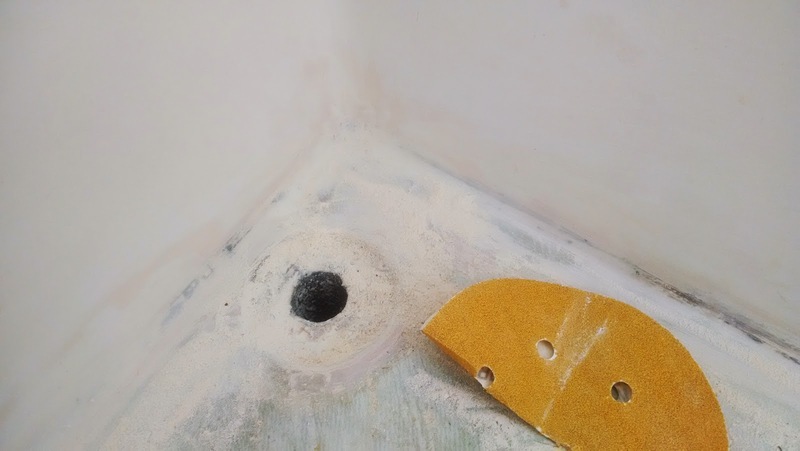 I laid down the first coat of fairing compound 4 days ago using epoxy with Aerosil and glass micro-spheres mixed in. 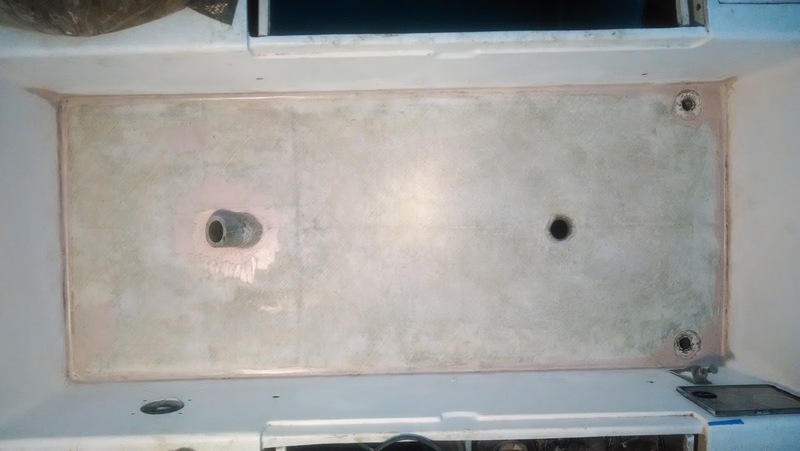 Unfortunately, the wet weather slowed things down because the epoxy blushed badly which required a solid washing of the deck (and drying) before sanding. The weather dried out a bit for the second coat and the blush wasn't nearly as bad, but I still gave it a good wash just to be sure. 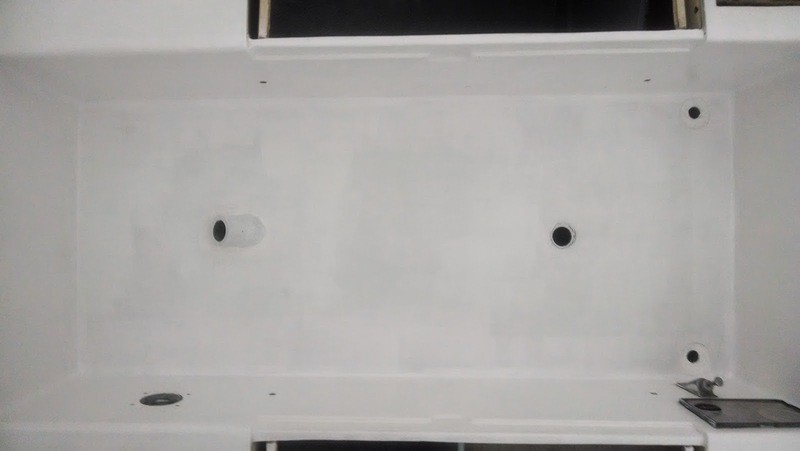 For the third coat I used System Three Quick Fair. I've been using it on and off for several years with good results. It's expensive, but it does sand nicely and dries in as little as 3 hours, so I usually use it for the final fairing coats when there isn't too much more to do. I applied this third and probably not final coat this morning at about 5AM. I decided I'd get up really early and get some boat work done before going into real work. I ended up working from home from about 10AM on and spent my lunch hour sanding down the last of the high spots. 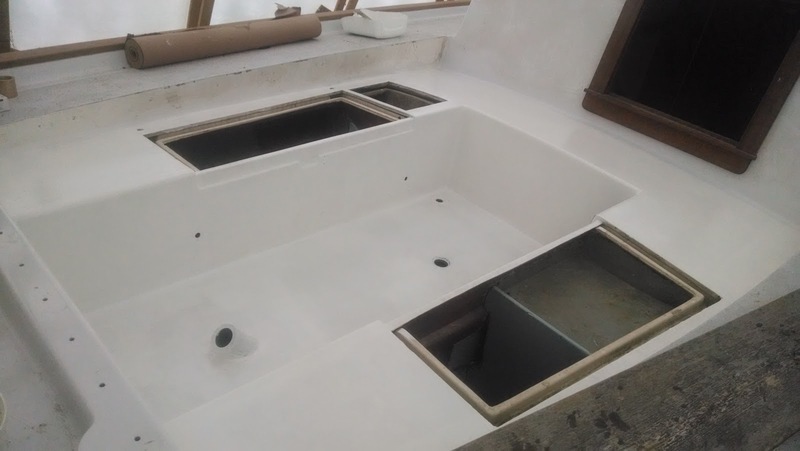 I was pretty happy with the result and felt it was time to lay down a coat of primer so I could better see any final spots that would need touching up. After I finished up work for the day, I spent about an hour thoroughly cleaning the entire cockpit, vacuuming, and then wiping everything down with acetone. I mixed up a batch of primer and went to work. It's a lot harder painting a cockpit than the foredeck because there are lots of corners and surface levels to work and I found myself struggling a bit to get everything without literally painting myself into a corner. I got it done though and I'm pretty relieved to get to this point. I gave myself a deadline of May 31st to decide on whether a launch will happen this year. Getting to this point is a big psychological boost and makes me think it can happen. I still have 10 days to make the call, but for tomorrow, I'll do some fairing touch ups (mainly around the scuppers and rudder post) and get it ready for the next coat of primer.